The late, great comedy legend, Jerry Lewis, left behind a unparalleled career filled with outrageous characters, impeccable comedic timing and outright lunacy! This hilarious triple feature boasts three beloved films from the height of his career! 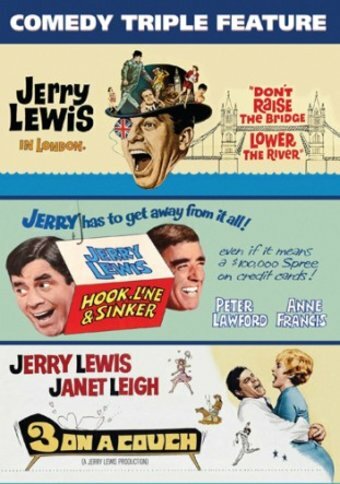 DON’T RAISE THE BRIDGE, LOWER THE RIVER (1968): It’s one of Jerry Lewis’s zaniest films, filled with the hilarious antics for which he’s famous! Jerry (Boeing, Boeing) plays George Lester, an American in London, whose grandiose schemes constantly get him into trouble. His first outrageous plan turns his wife’s ancestral palace into a Chinese disco, an idea she hardly appreciates. Forced to raise money to restore the mansion, George unveils an even crazier scheme with the help of his friend, William Homer (Terry-Thomas, I’m All Right Jack), to sell stolen plans for an electronic oil drill. George smuggles the plans into Lisbon where he is supposed to make the big deal, but then learns the plans are phony! He promises his wife he'll finally settle down, but wait – he has just one more idea! HOOK, LINE AND SINKER (1969): Peter Ingersoll (Jerry Lewis, The Nutty Professor) is living a humdrum existence as a family man and insurance salesman when he finds out from his doctor friend, Scott (Peter Lawford, Ocean’s Eleven), that he has a terminal illness. Thinking that his life is nearly over, he lives life to the fullest, building up insurmountable debt. When the debt becomes too much, Scott tells Peter that he is actually not sick. To remove the debt, Scott comes up with the idea to stage Peter’s death, allowing him to return after the statute of limitations is done. But when Peter finds out that his wife (Anne Francis, Funny Girl) and Scott are having an affair and that this was all a scheme to get rid of him, Peter has some work to do in this zany comedy. THREE ON A COACH (1966): Christopher Pride (Jerry Lewis) has been offered an important commission in Paris but can't convince his girlfriend, Dr. Elizabeth Acord (Janet Leigh), to take some time off from her psychiatric practice. Elizabeth is worried about three of her female patients, all of whom are extremely hostile toward men and very needy. 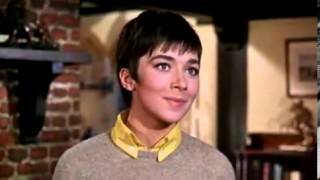 Christopher, anxious to leave for France, decides to impersonate the ideal man for each of Elizabeth's patients, in hopes of lessening their dependency on her.